My wife has come to understand that pretty much any vacation/long weekend/excursion is bound to include some beer exploration (Really, she loves it as much as I do). One of the first things I do when we decide to take a trip is research to figure out where we might be able to visit. So, last month when we were headed down to a wedding in the Trinity Alps of Northern California, I obviously wanted to fit in a couple beer spots. You can check out more pics from this trip here. Lucky for us, Medford, OR, was the closest major airport to fly into and then drive to the amazing Carville Inn, located in Coffee Creek, CA. If you’ve ever been to Medford, you might be wondering exactly why I’d say “lucky”. Well, on the beer front it’s exciting because I’m a fan of Caldera Brewing located in nearby Ashland. But, first and foremost, it’s because I finally got to visit the bakery that two of our good friends left Seattle to open a couple of years ago: Buttercloud. With a name like Buttercloud, you shouldn’t be surprised that they rock. Their specialty is biscuit sandwiches, and they are the best damn biscuit sandwiches I’ve ever had. You might think I’m biased, but I challenge you to prove me wrong. The owners also happen to be a couple of beer geeks, so you’ll always find a few solid local beers available for purchase. We only had a couple of hours to explore the Ashland/Medford area, and a visit to Caldera Brewing was at the top of my list. Caldera has been distributing beer to the Seattle area for several years, and I quite enjoy their beers for the most part. Their pale ale and IPA were two of the early entries into the craft can craze here in the NW, and they are both great examples of the style when clean (sadly, that has not always been the case in the past). They recently opened a huge new 25,000 square foot production facility with a similarly huge restaurant/pub attached. They also have a taproom in downtown Ashland, but our destination was the new brewery and pub. 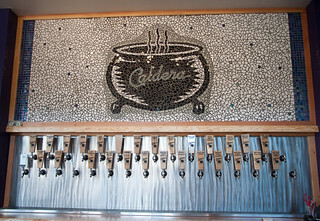 Having only seen a handful of different beers from Caldera up here in Seattle over the years, I was thrilled to find a wall of taps serving a whopping total of 27 Caldera beers. A couple of the taps were just dry-hopped versions of their core beers, but the large majority were unique offerings. We split a sampler tray that included a nice Helles Lager, Old Growth Imperial Stout, a surprisingly good Hemp Brown Ale, a solid example of a German-style Pils and their Hop Hash IPA, which uses “lupulin hashlike chunks” in the brew. We also had a taste of Red Sea, a collaboration beer they made with Big Island Brewhaus of Hawaii. It is an “Imperial Red Ale brewed with chocolate, molasses, pink peppercorns and Himalayan pink salt coming in at a whopping 8.8% alcohol”. The pub space itself is huge. 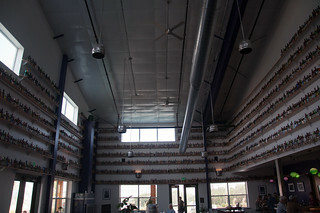 The most impressive feature are the walls lined with more than 4,000 bottles from the owner’s personal collection. 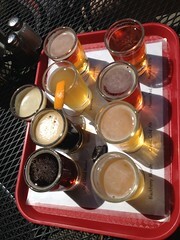 Had we more time, we would have also stopped in at Standing Stone Brewing in Ashland and Beerworks in Medford. We had the pleasure of meeting one of the owners from Beerworks while doing a tasting of Stone’s Vertical Epic Series that night with our friends, and it sounds like Beerworks has a great thing going on. 450 bottled/canned beers you can buy to-go or for in-house consumption, as well as six rotating taps for pints and growler fills. The next morning, it was a beautiful couple of hours drive down south to near the Trinity Alps. Our route brought us right by the town of Etna, where there happens to be a small brewery in the middle of pretty much nowhere. 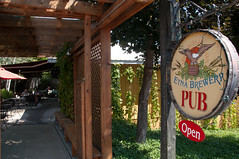 Etna Brewing Company has been open since 1990 and is located across the street from where there used to be a brewery that dated back to the 1800’s. It’s a perfect little pub and brewery, with a sunny patio, friendly service and lots of locals enjoying beers with lunch. There was even a fire crew having their lunch, taking a break from fighting a nearby wildfire. The beers were very solid overall. Their lighter beers were our favorites, with the Classic Gold, Blackberry Blonde & Holy Hefeweizen all sticking out. They had a nice variety on tap, including the Kappler Imperial Stout and Sno-Wooki Espresso Stout. Etna is definitely worth a stop if in the area. The final stretch of our drive brought us up over the very remote Scott Mountain Pass where we intersected with the Pacific Coast Trail. It is a beautiful area that I hope to return to someday. Once down Scott Mountain, it was just a short drive to the wedding destination, where we spent the next few days eating entirely too much, drinking from kegs of Fremont Summer Ale and Chuckanut Pils and just having a great time for our friends’ wedding. I love visiting beer spots on trips like this, especially places like Etna. Who knows if I’ll ever be in that remote area again, so I’m glad we were able to take advantage and visit the brewery. That’s a lot of bottles.